One of the big things that sets Spider-Man apart from other superheroes is how ingrained he is in his local community. He calls himself “your friendly neighborhood Spider-Man” to reinforce that he’s a kind, compassionate hero who wants to help with everyday struggles as much as the big, world-threatening superhero threats. Last month, The A.V. 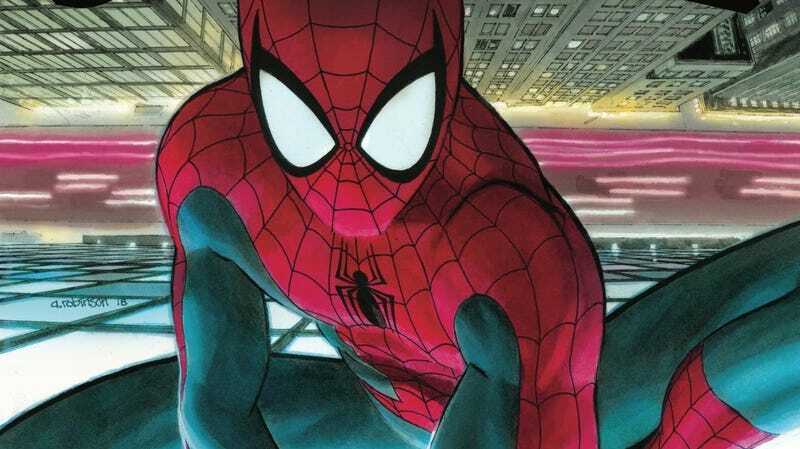 Club spotlighted how Tom Taylor’s comics are rooted in empathy, and the new Friendly Neighborhood Spider-Man series, written by Taylor with art by Juann Cabal, colorist Nolan Woodard, and letterer Travis Lanham, maintains that foundation by spotlighting Peter Parker’s strong connection with the people around him. He knows the homeless population personally and goes out of his way to help improve their lives, and when one of the other residents in his building is in danger, he takes on the responsibility of keeping her safe. Unfortunately, Peter can’t be in all places at all times, and when his neighbor is abducted and leaves behind two orange-skinned children, Spider-Man is left to babysit the kids while figuring out what’s going on. This exclusive preview of next week’s Friendly Neighborhood Spider-Man #2 shows Peter trying his best to comfort the two children, but first it introduces a new player to the story: Wilson “The Kingpin” Fisk, current mayor of New York City. Bringing in the mayor makes a lot of sense for a story focused on local issues, and this brief tease suggests that Taylor will be introducing more powerful figures from NYC’s past. The first issue of Friendly Neighborhood Spider-Man showcases how well Cabal and Woodard depict Spidey in action, but this preview focuses more on expression and humor, particularly when it comes to Peter’s shameless roommate, the supervillain Boomerang. Cabal makes very smart use of panel borders and gutters in these pages. When Spider-Man peeks out of his bedroom window, the blinds bleed into the white space of the gutters to add an extra level of dimension. When Marnie knocks on Peter’s bedroom door, Cabal uses the gutter as the door, uniting the two panels in a single image but also breaking down the moment into two separate beats. Cabal is constantly exploring new ways to present visual information, and after working together on the excellent “Orphans of X” arc in All-New Wolverine, Taylor and Cabal have developed a tight rapport that results in exciting superhero storytelling.